We are all bound by the rules and regulations of the organizations to which we belong. In an academic institution, the goal of these rules and regulations is to provide a safe and productive environment where students can learn and grow as individuals. Because problems, questions, and conflicts are inevitable, these rules and regulations also serve to establish a fair and balanced system for resolving unexpected issues that arise. Your explicit duties as a teaching assistant may be dictated by the professor or by the course, but you also have responsibilities that are implicit in the fact that you are both a student and an employee of the university. This website is designed to orient you to the policies that describe your role in the university and to the rules and regulations that govern how members of the university navigate the bureaucracy to resolve unforeseen issues. Which policies apply to me? The United States government has rules that limit the amount of information that a school can share about its students. These rules are described in the Family Education Rights and Privacy Act (FERPA). As an employee of the school, you are bound by these laws! Read them and follow them! It goes without saying that the university has its own rules and guidelines about how members of the university should conduct themselves. School policies are usually broken into different categories according to the different roles and/or situations that emerge within the school. At the USC Policies website, you can read about many of these policies. As a teaching assistant for a specific course, your primary responsibility is to the professor and the students. More often than not, the professor or the department will define a set of rules about what you are expected to do in the course. Additionally, you are bound by student policies because of your status as a graduate student, and by many faculty policies because of your role as an employee of the university. These policies will not apply universally but may depend on the specific situation that you are in. For example, if you are a student in a graduate seminar, you will not be expected to follow faculty guidelines while acting in that role. Conversely, when you are delivering a lecture or leading students through lab exercises, you will be guided primarily by your role as an employee. Determining when you should follow different policies can be confusing. Try to be aware of your responsibilities in each situation and be sensitive to the fact that your role in the university is highly fluid. Though you may be friends with undergraduate students, when those students are enrolled in courses where you are a TA, you are expected to follow faculty policies! If the situation is ever in doubt, always follow the more restrictive policy and then ask for clarification as soon as you get the chance! 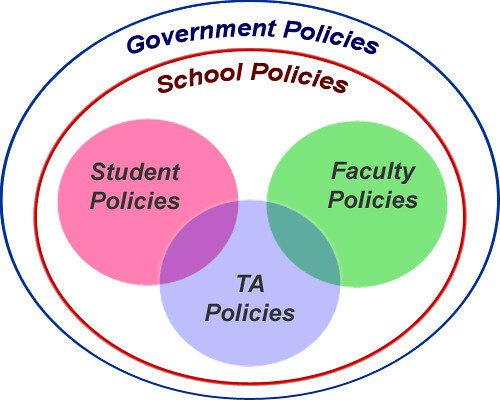 Although TA policies overlap with those of both faculty and students, there are some faculty and student policies that will not apply to you or to the situation that you are in. Despite this, you should familiarize yourself with these policies so that you can have a better understanding of how these policies determine the relationship you have with both students and faculty. It is also helpful to be aware of such policies in case a situation comes up where either the faculty or student violates them. For instance, a situation may arise where a professor unknowingly asks you to do more than you are allowed to do. Rather than risk the integrity of the course, gently ask the professor to clarify the request or recuse yourself from the assigned task. In these cases, always assume that the professor was not aware that the policies were being violated. Also, you may be expected to enforce student policies in the event that a student requests a grade change, attempts to cheat, or must drop the class under inopportune circumstances. 1. FERPA - Federal laws governing student educational privacy. 2. SCampus - A Guidebook for USC Students. 3. USC Department of Grades - Describes grade change policies and provides information on filing for an Incomplete. 5. Check with your department! 1. In addition to the policies and responsibilities set forth by the professor, policies are also dictated by both the government and the academic institution. Individuals are responsible for knowing where they fit in the policy picture! 2. As a teaching assistant, always assume that you are bound by the policies describing faculty conduct. This may not always be the case, but it is better to follow the rules first and ask later if specific rules apply to you. 3. Familiarize yourself with the responsibilities and policies governing the activities of the professor and the students. 4. As a first-time TA, read as much as you can about the policies that apply to you and your students. As a continuing TA, pay attention to policy changes — not knowing is not an excuse!